A file with the TBZ file extension is a BZIP Compressed Tar Archive file, which means the files are first archived in a TAR file and then compressed with BZIP. Although you may certainly still run into the occasional TAR files that use BZIP compression, BZ2 is a newer, and increasingly common, compression algorithm that produces TBZ2 files. 7-Zip, PeaZip, and jZip are just a few of the many free file extractors that can decompress (extract) the contents of a TBZ file. All three of those programs also support the newer TBZ2 format. You can also open a TBZ file online via the B1 Online Archiver webtool. This is a website where you can upload a .TBZ file you have and then download the contents - either one at a time or all at once. This is a great solution if you don't already have one of the file-unzip tools from above installed on your computer and you're not interested in doing so. Although its file extension is similar to TBZ, a TZ file is a Zipped Tar Archive file that's created by combining a TAR archive and a Z file. If you have a TZ file instead of a TBZ file, you can open it with WinZip or StuffIt Deluxe, if not with the free tools we mentioned above. At least on your Windows PC, If you find that an application you have installed opens TBZ files but it's the wrong application, or you'd just rather have a different installed program open them, see our article on how to change the default program for a specific file extension guide for making the necessary changes. We highly recommend using FileZigZag to convert the TBZ file to another archive format. It works in your browser so that all you have to do is upload the TBZ, choose a conversion format, and then download the converted file back to your computer. FileZigZag supports converting the TBZ to ZIP, 7Z, BZIP2, TAR, TGZ, and various other compression/archive formats. See our list of free file converters for occasionally used formats for some other file converters that may support the TBZ format. If you know your TBZ archive contains, say, a PDF file, and so you want to convert the TBZ to PDF, what you really want to do is extract the contents of the TBZ to get to the PDF. You don't need to "convert" the TBZ to PDF. So, while some file-unzip programs or online services may advertise that they can convert the TBZ to PDF (or another file type), what they're really doing is extracting the PDF from the archive, which you can do yourself with any of the methods we've already talked about. To be clear, to get a PDF (or any other file type) out of a TBZ file, just use one of the file extractors mentioned above - 7-Zip being a perfect example. 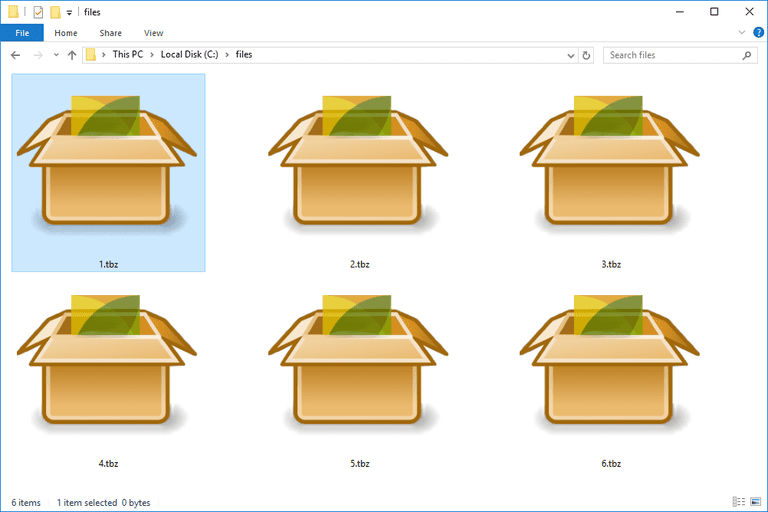 If you "convert" your TBZ file to PDF or some other file format, but you want that resulting file to be in a different file format, you can most likely do it with one of these free file converters.